The project aims to explore the use of autonomous vehicles through a model deployment in real operating conditions. Many people believe we are years away from seeing autonomous vehicles on our roads, but Keolis Downer disagrees. Automated technology has arrived, and its presence is increasing. Autonomous vehicles are coming, whether we are ready or not. In this context, Keolis Downer is taking the initiative to ensure we understand the implications for the community and Governments, and what is required for autonomous vehicles to operate safely in Australia. We are engaged in important work to assess the benefits and risks of this new technology. Keolis Downer is sharing this knowledge with transport authorities and the community so that Governments can consider regulations for them from first-hand experience. Keolis Downer sees autonomous vehicles as becoming an important part of the multimodal journey. They can potentially improve the passenger experience by providing an efficient solution for door-to-door journeys. We are engaged in assessing the particular ways in which autonomous vehicles can broaden our transport options. An important part of our enquiry is also to evaluate the community reaction to this technology so that we can design multimodal transport solutions that are even more flexible, broad and successful. 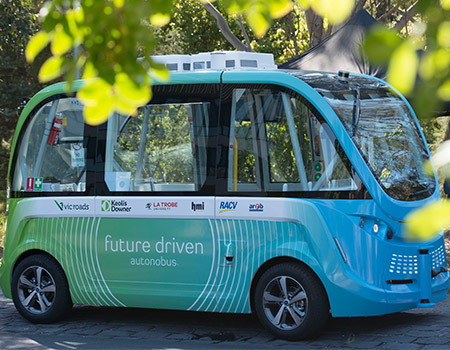 Keolis Downer has formed a consortium with key commercial and technical partners in Victoria to trial driverless shuttles on the La Trobe University campus. The consortium partners include La Trobe University, HMI Technologies, the Royal Automobile Club of Victoria and the Australian Road Research Group. The project, which began in August 2017 and will run for a year, has been partly funded by a $375,000 Victorian Government Smarter Journeys Program grant. HMI Technologies has supplied the project with a French-built Navya 15-person shuttle. This vehicle is fully autonomous (Level 4), has no steering wheel, and is electrically powered. La Trobe University’s Melbourne Campus is being used to test the vehicle, first with a limited proof of concept test away from other traffic, and then in a real operating environment on the campus. The vehicle uses GPS coordinates and state of the art sensor technology for detecting people or obstacles in its path. From this project, Keolis Downer and its partners hope to create a reusable commercial framework that will support the development of relevant regulations and/or legislation for autonomous vehicles as an everyday part of our cities of the future.